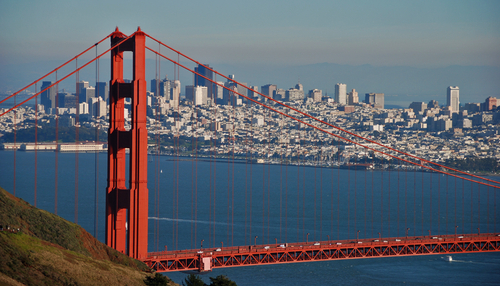 San Francisco gets a New Internet Network, Why? Posted in: Internet of Things. Tagged: internet of things, IOT, Sigfox. So you’re wondering ,why they need a new internet network in San Francisco? Apparently,our normal network is getting a bit cluttered with this IOT (Internet of Things)growth.With all sorts of devices now needing a connection to transfer data we find our selves running out of room.You say, now that can’t be possible .. we just need to make a bigger Internet Pipe to use.Just like adding lanes to a highway.Well, that is true.We could do that.In fact, that is exactly how I see Sigfox operating.They are targeting a “commuter lane” per se on the internet.They have come up with a lane on the internet that allows you to use a smaller bandwidth of information(100 bits per second)and millions of connections.Their technology is based on M2M( machine to machine) communications. Think of it like this: the commuter lane was first used for cars with 2 or more people and motorcycles.Now 2014, we have included electric and hybrid cars as well closed lanes with fast pass.Compare that to what is happening in SF with Sigfox, you can see how every small device from sensors on light meters , appliances,consumer gadgets (wearables) smart machines and god knows what else.They all can use these new lanes. Let’s embrace this new lane of the internet and be glad we can use more of it.Perhaps, it will take a while to get used to ,but I don’t see that it will be a problem.I see this as an opportunity to create more devices with connections to larger devices without dragging down the internet. And we all know what a drag that can be. Take a look at this article from Gigamon for more details. Posted in: Hadoop News, Jobs. Tagged: interview, interview questions. How interview smart are you about Big Data Hadoop? Everyone is learning the new game in town … Big Data – Hadoop. Not everyone has the practical knowledge and experience with Hadoop.This is what is being said by recruiters and head hunters every where.Job hunters know how easily to describe a subject clearly without any practical experience.Its it on the HR coordinators and head hunters to make the proper decision for the hire.If your the one looking for the job in this space, its your job to get the practical experience. If you don’t have the practical experience use these tips. Thanks for the article from Dice News. Is College Still Worth It ? Posted in: Big Data News, Jobs. Tagged: college, college infographics. Just to be clear… I think it is. Is Education worth it absolutely. Does what you spend equal what you will make ? Who knows. See how Big Data is being used to create this InfoGraphics on the subject. That being said, You can find a successful career without going to college.At what price do you wish to pay.I was once told there is a difference between a job and a career.Your time in school should help you decide this choice.Plus the fact that is part of your natural growing experiences in life.Not only that but every parent with kids dream of their child being the next big thing. Students are smarter and know now what the cost of college is.Not only how much it cost,but how much in debt they will be in student loan repayments. Check out this article from Salary.com and leave a comment. Posted in: Big Data News, Jobs. Tagged: infographic resumes, resume tips, resumes. Imagine that your could visualize your career,major milestones and achievements in one picture. Well today is the day to do it. We have come to the age that your resume will no longer be boring to the eye.Recruiters and HR coordinators will not have to search for keywords or write algorithms to pick that one candidate with all the skills.My first resume creating instructor told me that make it short and precise.The folks reading it will only take 15 -30 seconds on it.Then it goes in to 2 piles … the Circular one and the Folded one. I preferred the Folded one, so I followed his advice and for years made the same resume with tweaks here and there…Short and Precise. Today, we have the IOT (Internet of Things) and Social Networks to help us keep pace with the world.It is a natural fit for Big Data and InfoGraphics.The more data you have to back your statistics and presentations, the smarter you seem to be.Like manipulating numbers in a report.”Numbers Don’t Lie” but they can be manipulated and misinterpreted. With the job market like it is now, it would be hard not to try to use every digital trick in the book.You need to join clubs,meetup ,twitters , Facebook and every reputable job boards available. With that said, why not join the InfoGraphics move and create one for a resume.I think I will give it a try.What the heck, nothing to lose but time and nothing to gain but knowledge. Read the following article from Dice News and comment your thoughts.